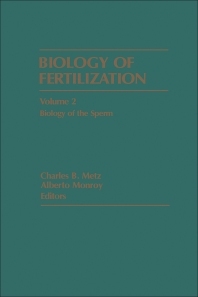 Biology of Fertilization, Volume 2: Biology of the Sperm is the second in a three-volume series that brings together various lines of research about reproduction in general and fertilization in particular. It is devoted to spermatogenesis, sperm physiology, and the initial interactions of sperm with egg components. The book is organized into three parts. Part I on spermatogenesis and sperm physiology includes studies on the evolution of the sperm cell; regulatory mechanisms, sperm antigen differentiation, and maturation of sperm in the reproductive tracts in mammals; physicochemical mechanisms of the acrosome filament extrusion process; and enzymes associated with sperm cell function. Part II deals with chemotaxis in microorganisms: bacteria and slime molds. Part III on gamete recognition and binding includes studies on identifying, isolating, and characterizing specific sperm and egg surface components involved in sperm-egg interaction; fertilization in the alga Fucus; fertilization in insects; and the role of lysins in fertilization.